The Sackler Family has recently been in the news because of a lawsuit filed by the state of Massachusetts against Purdue Pharma, a pharmaceutical company owned by the Sacklers. The lawsuit is attempting to hold the company – and more specifically Sackler family members and Purdue board members and executives – accountable for contributing to the United States’ opioid crisis. Just last week, the City of New York added eight members of the Sackler family to a $500 million lawsuit filed last year to offset costs related to the opioid crisis. Purdue Pharma is the producer of the opioid OxyContin and released the drug 1995. According to an Esquire article from 2017, “Purdue Pharma was the first to achieve a dominant share of the market for long-acting opioids, accounting for more than half of prescriptions by 2001.” By 2001 sales of OxyContin had surpassed $1 billion. According to the Centers for Disease Control (CDC) between 1999 and 2017 over 200,000 Americans have died because of overdose on prescription opioids and, overdose deaths involving prescription opioids were five times higher in 2017 than in 1999. Although there have been previous allegations that Purdue Pharma 1) hid the fact that OxyContin is highly addictive and 2) that the company saw and capitalized on this addictive quality to sell more of the drug, there is mounting evidence to show these allegations are true. Richard Sackler, former Chairman and President of Purdue Pharma, has been identified as a key player in pushing OxyContin sales and then, when opiod addiction became a crisis, putting the blame of addiction on patients. A New York Times article reports that in 2001, when he was president, Sackler wrote an email saying, “We have to hammer on abusers in every way possible…They are the culprits and the problem. They are reckless criminals.” Marabou is talking about the Sacklers today because the Sackler name is on museums across the US and abroad, including the Metropolitan Museum of Art in New York, the Victoria and Albert Museum in London, and the Louvre in Paris. Over the past few years, there has been growing concern around the ethics of museums accepting Sackler money. P.A.I.N. has organized actions in various museums and continues to bring attention to the Sackler contribution to the opioid crisis. The Art Newspaper went on to clarify that Mortimer and Raymond Sackler, now both deceased, were involved in OxyContin’s release in 1995. Richard Sackler, at the center of the Purdue Pharma investigation, is the son of Raymond. Jillian’s statement asserts that not all Sacklers have profited from the opioid epidemic. A 2018 investigative article in The Atlantic says the descendants of Arthur are not completely in the clear due to some repayments to the Arthur Sackler estate by the Purdue companies in 1997. Where do you stand when it comes to the presence of the Sackler name in museums? Take every reference to the Sacklers down? Or should the Arthur Sackler name remain and just the names of Mortimer, Raymond, and their descendants be removed? 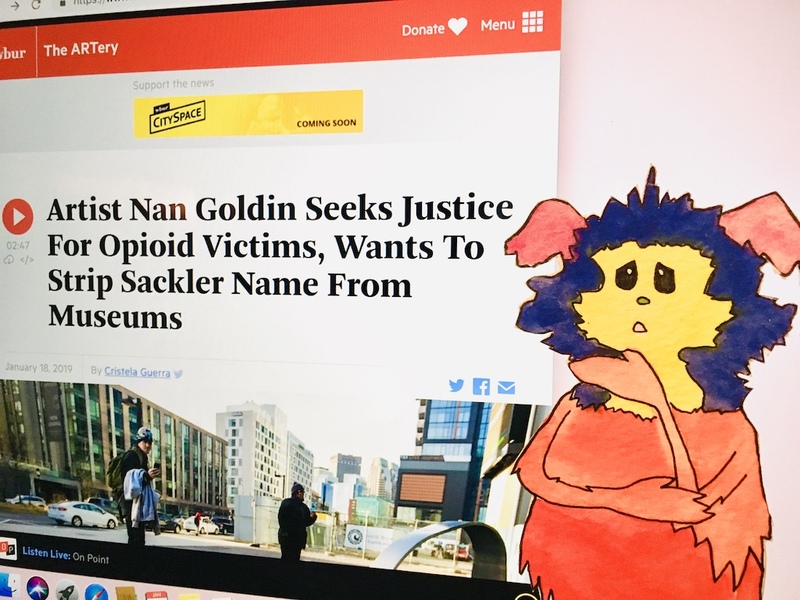 Marabou hopes that the press coverage of the Sackler family’s involvement in big pharma, the opioid crisis, and museum funding rings bells across the museum world inspiring institutions to revisit their list donors and think about where the money comes from. There will need to be ongoing external pressure from the public for museums to actually reevaluate their funding sources and take a stand against accepting “dirty” money. The next time you visit a museum, take a look at the donor wall. Pay attention to whose names are on the entryways to galleries. Search the donor acknowledgement page on a museum’s website. Bring attention to a donor or donation that has come from unethical and questionable sources. Previous46% of American museum boards have no trustees of color. How can boards become more diverse?